Please send me a price for the UP-4840-FP-StrucCell 48x40 used plastic pallet. The cross-bottom cruciform base of the 6 runner UP-4840-FP-StrucCell plastic pallet is a good match for block stacking. Our used UP-4840-FP-StrucCell plastic pallet offers the expected reliability and quality of long lasting plastic at used pallet prices. 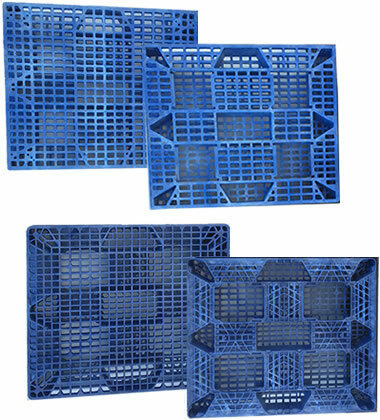 Plastic pallets like the UP-4840-FP-StrucCell are lightweight and durable. Its uniform length and width provide ease of use and safety. Get more turns using the UP-4840-FP-StrucCell multi-trip plastic pallet and easily win back startup costs with durable and reliable plastic. Use the UP-4840-FP-StrucCell captive plastic pallet in closed loops to satisfy in-house reusability requirements with the reliability of plastic. Save costs when shipping cargo via air with the UP-4840-FP-StrucCell air freight plastic pallet. Perfect for single use and one-way air shipment. Mixed load from 3 manufacturers: Orbis, Cookson and Amoco. The Amoco and Cookson (top pic) are nearly identical. Orbis (bottom pic) has slightly different bottom pattern and side. All top decks, measurements and capacities are the same. Limited quantities. Will not get more. First come, first served. Is the UP-4840-FP-StrucCell the right pallet for you?